About a year ago I noticed what I would call an emerging trend in décor and as I am yet to see anything written about it on local blogs, I’ve taken it upon myself to tell you about a trend I hope will be in full swing next winter. So consider this a trend forecast, brought to you by Tassels & Tigers Interiors. 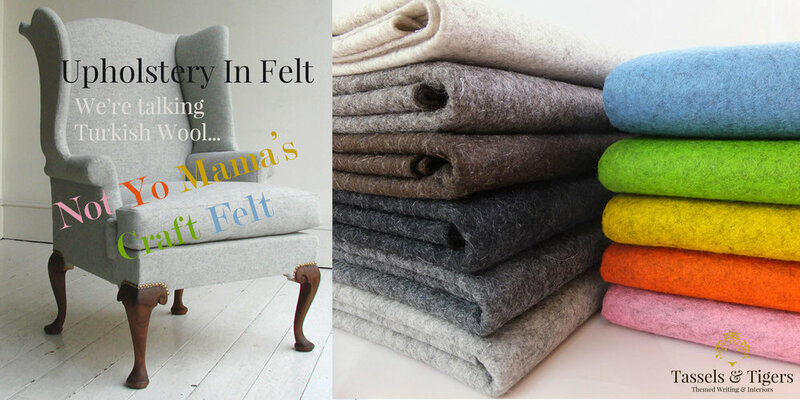 Felt: The colourful stuff crafty moms and their kids’ dreams are made of… now also for stylish décor lovers and their homes. This is craft felt – one of the oldest non-woven fabrics traditionally made from wool via a process called felting, but now made from polyester, acrylic, rayon, viscose and of late, recycled plastic bottles and bamboo. This is beautiful, but it’s not what we’re talking about. Felting and crafting in felt is a very popular at the moment, and I suspect this trend is what gave rise to the return of the fedora. And even though fashion trends don’t normally precede interior ones, it is my humble opinion that it is this fedora, which returned with flair a few years ago, that has led to upholstery in felt fabric. 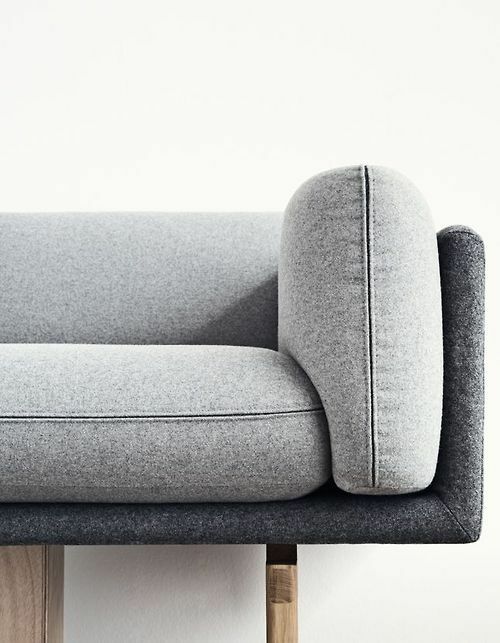 We’re talking about a thick, luxurious wool felt in muted tones which makes for a durable (although not washable), understated modern upholstery fabric. The reason why I noticed this trend is because I had a new carpet installed for a client and loved the underfelt they used. I liked the industrial, unfinished look of the mixed grey materials spotted with colour and wanted to do something with it. Then I stumbled upon something similar at Hertex - Lincoln. Their 86% Turkish Wool Felt - perfect to create the look I was after! Lincoln - 86% Turkish Wool Felt. Available in various muted colours from Hertex. Made up by Tassels & Tigers Interiors. I haven’t seen it used in too many places other than a curtain, two scatters and a chair, but the fact that Hertex, amongst others, have wool felt in their catalogues, means it’s coming! In fact, it's recommended for industrial use! Which basically means you can put your bum(p) down on it tens of thousands of times without it wearing out the fabric. Large Felt Storage Basket from Makro at R259. Khaki Green Fedora with Gold Metal Detail from Spree - R149. Messer Fedora in Black from Spree - R699. That's a bum(p)er and that's about all we can say about that. #2 Apparently, if you have cats, they will ruin it. We’re talking in excess of R1000 / meter. Fortunately, if you don’t feel like spending that kind of money, there are much more affordable options that have a similar appearance. Get in touch with me if you’d like to explore these options, or the real deal, to give your soft furnishings a very fashionable, ahead of the curb look.